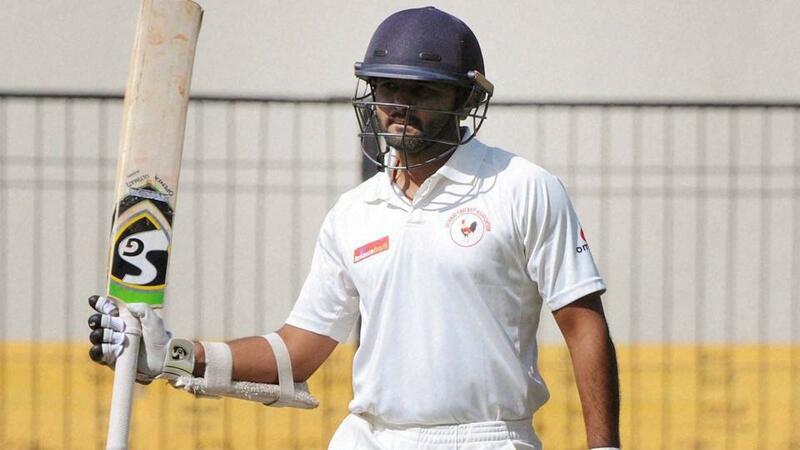 Parthiv Patel scored 143 on Day 5 in the final of Ranji Trophy. Priyank Panchal (Gujarat) - 105 more runs and this right-hand opening batsman from Gujarat would have broken VVS Laxman's all-time record of most runs in a season. 105 runs are a lot of runs in cricket but not for someone who was in as a good touch as Panchal was. He was the music to Gujarat's lyrics. With 1,310 runs in 10 matches, he was the highest run-scorer in this season of Ranji Trophy. His triumphant season included five centuries (including a triple century) and a batting average of 87.33. Prashant Chopra (Himachal Pradesh) - As a team, Himachal Pradesh failed to make it to the knockouts but their opening batsman in Prashant Chopra finished as the 3rd highest run-scorer in this season of the Ranji Trophy. In nine matches, he scored 978 runs at an average of 57.52 and a strike rate of 85.34. His highest score of 237 came versus Haryana in Valsad. Samit Gohel (Gujarat) - 26 year-old Samit Gohel made his way into the record books during the quarter-final against Odisha in Jaipur. His innings of 359* made him the highest scorer to carry the bat in first-class cricket. The knock lasted for 964 minutes and was the 3rd longest in first-class cricket. In the 10 matches he played in this season, he scored 914 runs at an average of 60.93. Parthiv Patel (Gujarat) - Notwithstanding his one and a half decade old career, this was perhaps his best season as it was the first time when his team, Gujarat, ended the season as Champions. Being the captain of the winning team, he will lead and keep wickets for this side as well. His 763 runs in eight matches in this season came at an average of 58.69. His best of 143 came during the showdown versus Mumbai on a Day 5 wicket when his team needed him the most. Rishabh Pant (Delhi) - From the ICC U-19 World Cup 2016 to the IPL and from scoring a triple century at a strike rate of more than 100 to the Indian T20I side, life is on a whistle-stop mode for this 19-year old left-hand explosive batsman. In what was his second Ranji season, he amassed 972 runs in eight matches at an average of 81.00. His strike rate of 107.28 in this format of cricket was the fluoresce in his batting. G Rahul Singh (Services) - Nine matches. 945 runs. Average 72.69. The fact that this was his debut season as a first-class cricketer rounds off the quality of season he had. He scored two centuries and seven half-centuries during the season. Abhishek Nayar (Mumbai) - Perhaps the perfect medium-pace all-rounder who would come in handy for his team in any situation. Such was Nayar's eminence in Mumbai's side. Whether the team would be short on runs or on wickets, the 33-year old workhorse made sure that he rose to the situation. His left-hand batting enabled him to score 588 runs in 10 matches at an average of 45.23. His right-arm medium-pace fetched him 25 wickets in as many matches at an average of 27.68 and an economy rate of 2.52. Shahbaz Nadeem (Jharkhand) - This 27-year old left-arm orthodox spinner is on his way to become the archetype of consistency. 56 wickets in 10 matches set the seal on for him as the highest wicket-taker in a Ranji season for consecutive second time. His bowling average of 25.60 and an economy rate of 2.90 give a better testament of his skills. The doors of Indian team will not remain far away if performances like these continue in the future. Shadab Jakati (Goa) - With 41 wickets in nine matches, 36-year old Jakati finished as the fifth highest wicket-taker in this season of Ranji trophy. A veteran of 18 years, this slow left-arm orthodox bowler has been consistent for Goa all through his career. Anupam Sanklecha (Maharashtra) - A bowling average of 16.18 is the best as far as Top 10 wicket-takers of this season are concerned. 34-year old Sanklecha bagged 43 wickets in eight matches at a strike rate of 36.1. His right-arm medium-fast bowling was crucial for Maharashtra throughout the season. Ashok Dinda (Bengal) - In what was another fruitful domestic season, hardworking Dinda grabbed 39 wickets in seven matches at an average of 19.53 and a strike rate of 37.6. His unflagging attitude towards fast bowing brings out the best out of him, even at the age of 32.
Review - IND vs ENG - 1st T20I.